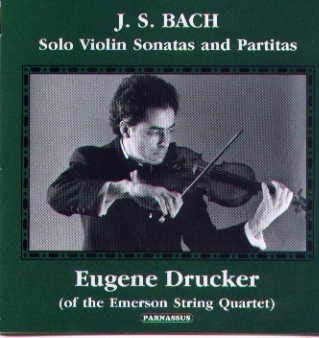 Throughout his tenure with the Emerson String Quartet, Eugene Drucker has maintained a separate solo career and has made a number of independent recordings. This major recording, made in 1988/89, was a casualty of the early demise of the Novello label, which first issued it in 1989. Only 1,000 copies were pressed, and the recording was never distributed in the U.S. Now it returns in sparkling new sound. Eugene Drucker, a student of Oscar Shumsky, is a founding member of the Emerson Quartet. With this ensemble he plays more than 100 concerts a year. But he continues to make time for independent projects, including his annual appearances with the Berkshire Bach Ensemble in its New Year's Eve/New Year's Day performances of the Brandenburg Concertos. His Bach performances are the fruit of long consideration and study, reflected in his own program notes for this recording. The original digital recordings, made by David Hancock and Da-Hong Seetoo, were remastered by Seetoo for this reissue. The results surprised even Drucker, who says the more immediate sound quality actually makes him more satisfied with his performances.